I went to see Andrea Chénier at the Opera Orchestra of New York and I wrote about it for Bachtrack. serviceable but hardly creative ballads. No, I didn’t go to the Les misérables movie. 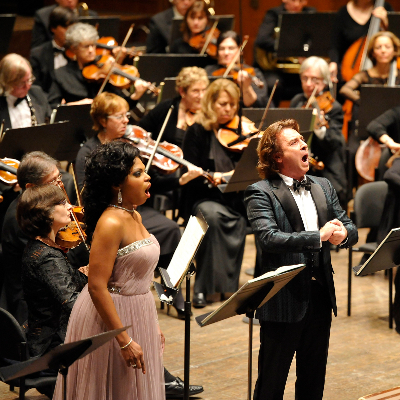 I went to see Roberto Alagna in Opera Orchestra of New York’s concert presentation of Umberto Giordano’s Andrea Chénier. Read the rest here. This was bad, people. Roberto Alagna had barely learned the music, had no conception of the role, and seemed not quite present all afternoon. Alberto Veronesi is not a master conductor and didn’t offer anything to make up for this deficit, nor was he probably the ideal choice to lead someone unsure through this rhythmically tricky music for the first time. Kristin Lewis had some issues and this role was a little more than her voice can handle right now, volume-wise–at least with Veronesi’s insensitive conducting, in the unfriendly surroundings of Avery Fisher–but the sound is interesting, and I would like to give her another chance under happier circumstances. George Petean was the real pro here, and turned in a thoroughly decent performance, though not as scene-stealing as Rosalind Elias. But a sad spectacle. I like Alagna (sometimes, it seems, inexplicably), the guy still has an attractive voice and considerable charm, but this was embarrassing for everyone. Maybe it’s personal issues, maybe he just didn’t take this gig seriously, but I hope this is just a temporary slip. Alagna was ill. Why is no one mentioning this? By the third act he was chugging water and by the fourth he was sniffling (sometimes audibly) into a handkerchief and coughing gently. Near the end of the curtain calls he introduced his doctor from the third row and said he wouldn't have gotten through it all without him. I mentioned that he appeared ill in the full review. But it doesn't explain why he seemed to barely know the music… a cold doesn't make you sing the wrong notes at the wrong times, really. Mr Alagna always did the right notes at the right place as far as I know. He had to stop the orchestra once because it was one bar late due to wrong beat count from the conductor who did better the second time. Nothing to do with Mr Alagna.
" a cold doesn't make you sing the wrong notes at the wrong times, really." sometimes it can. Should he have cancelled?? OK, I watched the video and followed with a score. I didn't read the text because it seemed to have an agenda. Alagna and the Veronesi are not looking at each other, which in an underrehearsed accompanied recitative is SUICIDAL. I have no idea what either Alagna or Veronesi were thinking, because the former continuously speeds up as the latter continuously slows down. As Alagna can't hear his notes in the orchestra he goes weirdly out of tune, starting on "palpitar dell'anima." The rushing could have to do with the tessitura of the line "fanciulla, qual poema," which, judging by the state of Alagna's higher notes, he probably wanted to get through as quickly as possible. It's not particularly complicated music ("Un dì all'azzurro spazio guardai profondo," the following section, is much trickier). Had they been looking at each other (and perhaps listening to each other a little more too…) I doubt it would have happened, but they don't have a clear sightline. What were they thinking with this setup? I don't think Alagna's decision to sing when he was in no state to do so–whatever the cause–is noble. While we all enjoy the radiance that emanates from his person, we showed up to hear Andrea Chénier and on that front there wasn't too much happening. I have been reading all of the reviews about the concert on January 6th and it seems to me that Alagna could not win! If he had cancelled he would have let down his fellow musicians and the critics would have all reported he was (a)afraid of the role and (b) he was still getting his fee while staying in the comfort of his hotel room. He sang the role and, of course, the critics were all over the fact that they thought role was beyond his talents. Surely he has shown time and again that he is a committed artist and gives of his best.